This Christmas season, I’ve decided to look at some great gift ideas and in my opinion, their not as great counterparts. This way, when you’re out shopping for your favorite home cook, you won’t be suckered into buying the fanciest and highly excessive products. My first example has to do with thermometers. I was really hoping for an instant read thermometer under the tree this year, and after doing some research on them I couldn’t wait any longer, so I purchased one just in time for Thanksgiving. You must beware though; there are many thermometers out there that say they are “instant read” where in fact they can take up to 1 minute to get an accurate reading. I know, I own two of them and they work fine but take forever (10 to 20 seconds) to give you an accurate reading. Your food would definitely get a little chilly with the oven door open that long. So, do your research before purchasing. Or have a look at mine. I purchased the ThermoWorks Super-Fast Thermapen and haven’t looked back. Its readings are almost instantaneous. I say almost because no thermometer is going to give you a completely instant reading, that’s magic. But a few seconds into your food and the reading is accurate. This instant thermometer is not cheap. I picked my up at Amazon for $96 bucks. My wife thought I was out of my mind but after seeing how well it worked on Thanksgiving, she was OK with it. While looking online for other thermometers, I came across a couple that boasted their ability to talk. Yes, you read correctly””talking thermometers. Why, I thought, would anyone need a talking thermometer? For most leave-in or remote thermometers, an alarm would suffice. 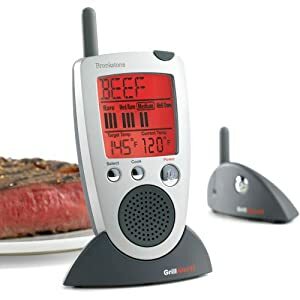 An example of an unnecessary thermometer is Grill Alert Talking Remote Meat Thermometer. While I like its remote capabilities and its big, easy to read screen, it just seems needless to have a thermometer talking to me as I’m grilling some chicken. Not to mention, the settings of the thermometer are set to USDA guidelines for meat doneness temperature. For example, the turkey setting is set at 180 degrees F. If you were using those guidelines for roasting your Thanksgiving turkey, you’d come out with one dry and most likely burnt gobbler! So if you are looking for remote thermometer for half the price that works just as well, find one that doesn’t talk. I always laugh a little when I hear that. While I do like the convenience and size of the slap chop as well as how easy it is to clean, it seems too good to be true. The television ad shows the host chopping onions and garlic with the skin on and easily removing the skin once chopped. This seemed a little far-fetched, and it seems some users online had complaints about the Slap Chop not living up to its expectations. I have to be honest here, I do not own a Slap Chop and have never tried one so if anyone reading this post has had a great experience with their unit, I would love to hear from you. While a knife may suffice in most situations, I prefer using a food processor for easy chopping, dicing especially when prepping for a big dinner party. I particularly like food processors with the mini bowl attachment, like KitchenAid’s 9-Cup Food Processor with 4-cup Mini Bowl. The 9-cup bowl is great for bigger culinary feats whereas the 4-cup mini bowl is great for smaller tasks such as chopping nuts, onions, mincing garlic and more. The food processor comes with many added accessories like a dough blade, shredding disc, spatula, cleaning tool, stainless steel multi-purpose blade and instructions with recipes. The bowls, blades and discs are all dishwasher safe and the chrome body is easy to wipe clean. For more professional results, definitely choose a food processor over the suspicious Slap Chop. 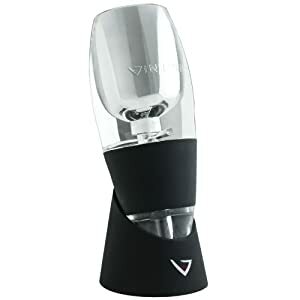 One of my favorite wine gadgets is the Vinturi wine aerator. This little device is placed over a glass or a decanter and you pour your favorite red wine through the Vinturi. This supposedly leads to a much more enhanced flavor and smoother wine. I’m not sure if I agree with everything they say, but it does aid in aeration and is a lot of fun to break out when entertaining. It makes a unique whirling – sucking sound that never fails to impress my friends. The Vinturi aerator comes with a standing base, both dishwasher safe. You can also purchase the Vinturi Tower, which suspends the Vinturi aerator, allowing you to aerate your wines without having to hold the device but come on – is that really necessary. It also comes with a grate base for catching any drips. Now that’s innovative. Another product that Wine Enthusiast endorses is the Clef du Vin Pocket Wine Tasting Tool. The tool claims to “Mature young wine instantly.” I had a good laugh when I continued to read about it. Basically, Clef du Vin claims that if you dip its metal alloy tip into your wine it will replicate the aging process, stating that if you leave it in your wine for 1 second, it will age your wine 1-year. So you’re telling me, I thought, that if I leave this thing in my wine for 30 seconds, it would possibly turn to vinegar?? I ventured to the Internet and found some positive reviews about the Clef du Vin, saying that it enhanced the flavor of their wine and definitely seemed more mature. I also read some reviews of people finding that their wine wasn’t enhanced, but rather ruined because of the device. Many people felt that the $99 could be spent on better wines than this product. One customer purposely left it in their wine for 30-seconds and found that their wine was no longer enjoyable. Talk about a vintage wine. Although I have not experienced the Clef du Vin, my recommendation is to go with the Vinturi instead and definitely invest in a good quality decanter and make sure you let your wine breathe for at least half an hour before drinking. But again, Just My Opinion! I would love to hear from you if you have had any experience with this tool.